if you know me, you know i love a good dystopian read. what you also know is i love fresh takes on the genre/subgenre. 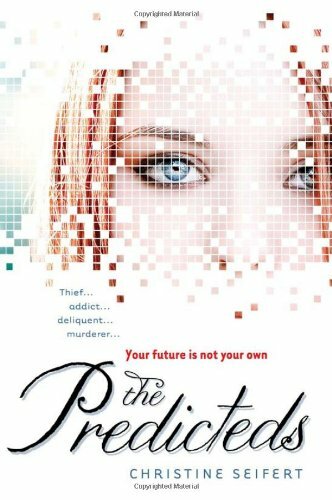 which is why i'm pretty stoked about The Predicteds by Christine Seifert. i'm super excited to have the author, Christine Seifert, guest starring on the blog today! she discussed her favorite dystopian novels yesterday over at The Bookish Type (which resulted in me adding more books to my 'have to read this book right stat now' list). today, she's talking about what she likes to do when she's not writing. 1. Bowling. It's an activity that I used to mock. Until I tried it. It's the most relaxing thing I've ever done because it requires zero brain power. (Don't get me wrong, I'm sure there's strategy involved for real bowlers. But I'm not a real bowler. I'm awful. I don't need any brain power to bowl a seventy-two). Nothing beats rolling that ball and hearing the pins drop; it all clears my head, and it makes me ready to tackle tough writing problems. 2. Watching TV. I love to watch TV, and I'll admit it. But I'm not a random surfer (like my husband who would watch a cat food infomercial if that's what was on). Once I find a great show that I love, I'm there in my seat, ready to watch. Mad Men and True Blood are two of my current favorites. 4. Talking to my mom. My mom lives in Fargo, North Dakota, a long way from me, so we only see each other two or three times a year. That's not enough to keep current, so our twice-weekly phone calls keep us updated on each other's lives. We probably log two to three hours of phone talk a week. She's the only person in the world who is truly interested in what I had for lunch. ("Turkey with provolone? Was there mayonnaise? Tell me all about it.") There was a time when I was an adolescent that we were mortal enemies. Now she's my best friend. Getting old has its privileges. 5. Hanging out with family. I have lots of nieces and nephews who are all adorable and extremely entertaining. Soon they'll be old enough that I can start pushing my books on them. 6. Reading. At the end of the day, reading is my go-to-feel-good hobby. It's the thing I most want to do every single day. There's nothing better than hanging out on my porch reading while the birds chirp all around me. I could turn pages (or flip screens) all day long if I could. In fact, if I could be a full-time reader, that's the job I'd want. Any openings?? If so, let me know immediately! So what do you all do for fun? thanks to Christine for sharing more about who she is when she's not writing! i won't tell anyone about your Jersey Shore guilty pleasure (i watch Maury, for goodness sakes). while i'm not as interested as your mom regarding your turkey sandwich, i do find it absolutely charming that you two talk twice a week. adorable! for more Christine Seifert goodness, check out Paperback Treasures on Monday for her author interview! i read her interview yesterday with the list of dystopian novels, and i loved it. she's so fun. and she is fun in this interview as well. i've never bowled a 72 in my life. i'm the world's worst bowler. but i love it so much. i'm very competitive and have the best time ever anytime i'm lucky enough to go.